Within its walls lie the Jewish people of old Bath. What is unusual is that there are no memorials to Jewish mayors or councilors, or folk with other distinctions or celebrity. The inhabitants of the cemetery are as low-key in death, as they were largely in life, and this gives as good an idea of the quiet ambiance of Jewish life in the city as any. 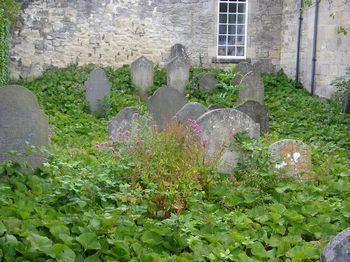 Within there are about 50 tombstones, contained in several rows of stones; the majority are uprights, but there are five chest and horizontal tombs. Many of the tombstones have bi-lingual inscriptions, though a number are only in Hebrew. The overall styles of the stones reflect local Christian styles and indeed local (Christian) monumental mason have placed their company name on the margin of some of the stones. Twenty-nine of the tombstones date from before 1901. CemeteryScribes please Contact Us THANK YOU! !